Full-access, frameless cabinetry with 15% more storage space than framed cabinetry. Offer a variety of drawer systems from fully sanded and finished wood dovetail full extension soft close to contemporary metal. Self-closing, 110° concealed, adjustable hinges. Waterborne finishes, no harmful VOCs. More than 100 door styles in Cherry, Maple, Lyptus, Knotty Alder, Clear Alder, Red Birch, Walnut, and Quarter Sawn and Rift Cut White Oak. 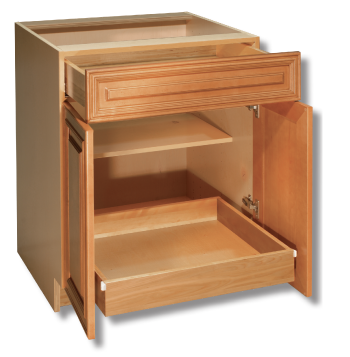 Executive Cabinetry features a Lifetime Limited Warranty. See your dealer for details. All of our drawer systems from Executive Cabinetry feature a soft close mechanism for a smooth, silent drawer closing. Drawers and pullouts will have perfect movement with quiet, effortless operation. Pullouts are manufactured of the same material as the drawers and also features the same soft close glides. All wood drawers feature sanded and finished dovetails for a refined, finished look.